The Boy Wonder isn't just a Best Buy bonus anymore. The news that Robin would be joining Batman in his Arkham City adventure is hardy brand new, but the news about how you can get in the UK definitely is. Pre-order the game from GAME or GameStation, and you can have a Boy Wonder of your very own, which is nowhere near as creepy as it sounds. 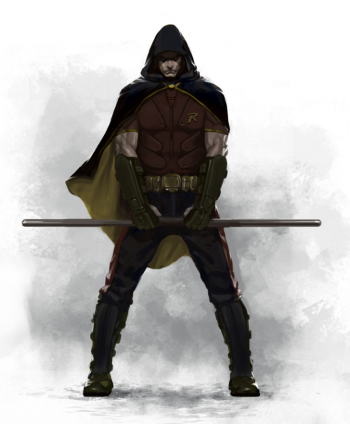 Robin has received a revamped look for Arkham City, taking inspiration from cage fighters, and adding a hood to his cape. Just like the Best Buy pre-order, the pack contains extra challenge maps, and a Red Robin alternate costume. You can use Robin in any of the challenge maps; his gameplay differs from that of his mentor, focusing more on explosives than the Dark Knight does. It's quite impressive how Rocksteady has taken a costume that can sometimes look a little silly, and made it look like something that someone might actually wear. Through the costume alone, my interest in seeing Robin in Arkham City went from somewhere around "none at all," to "this could be fun." The literally explosive gameplay is just a bonus.